Sold by the 1,500-foot roll in widths ranging from 4 to 34 inches, PVC shrink tubing is a wonderful shipping option for many different items. 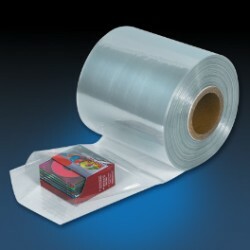 Sealed on two sides, this shrink film is perfect for making shrink bags and is durable and makes a perfect option for high-gloss, professional-looking packaging. This shrink film also shrinks to the shape of the product being shipped at a lower temperature than regular shrink wrap, which can mean production time and cost cuts, which improve efficiency of your operation. Our shrink tubing fits virtually any package you might need to ship, and our prices are competitive with any you'll find anywhere. And if you have any questions, feel free to contact us and our professional staff will guide you on finding the right shrink film for your product and shipping needs.